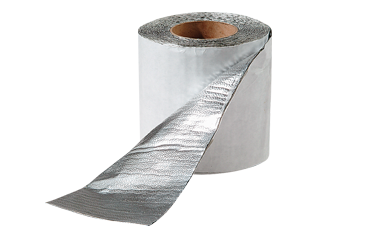 Peel & Seal is easily installed by removing the release paper and pressing the aluminized membrane into place. Peel & Seal can be cut to fit using scissors or a razor knife. Peel & Seal adheres to the deck and to itself when overlapped. When overlapping the product, 3″ side laps and 6″ end laps are required. Peel & Seal is a multi Purpose weatherproofing material. Apply infiar weather at temperatures above 60 degrees. A minimum slope of 1/2″ per foot is required. Peel & Seal may be applied directly to roof decks including wood, metal, masonry and existing smooth asphalt roofs.